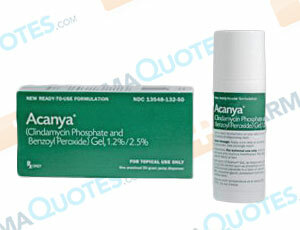 Acanya Gel (clindamycin phosphate and benzoyl peroxide) is a combination of benzoyl peroxide and clindamycin. It is effective in treating acne vulgaris is patients 12 years and older by fighting bacteria and helping the skin wash away oil and dirt. Topical medications like Acanya Gel are absorbed into the skin and may cause serious side effects. If you have enteritis, ulcerative colitis, or have ever experienced severe diarrhea because of antibiotic medicine, you may not be able to use this drug. Make sure you share a full medical and drug history with your doctor, because your health information may make this treatment less effective or dangerous for you or your child. Acanya Gel should be used as directed by physician or pharmacist. It should not be applied to sunburned or dry, irritated, or broken skin. This drug increases sensitivity to sunlight, and may result in severe burns if exposed to direct light like that from a tanning bed. The most common side effect of Acanya Gel use is extremely dry skin. If you experience signs of allergic reaction or extreme irritation to the area applied, call your doctor immediately or seek emergency medical help. General Acanya Warning: The above information is for informational purposes only and is not meant to be a substitute for professional medical advice, diagnosis or treatment. Please seek professional medical advice before starting, changing or terminating any medical treatment. Pharmaquotes is not offering medical advice, pharmaceutical recommendations or endorsing any specific prescription drug, pharmacy or other information on the site. Pharmaquotes provides no warranty or guarantee for any of the discount data, medication, or other information.